A fresh coat of paint can solve a lot of ills, but when you’re painting a room, there is a lot that can go wrong. A fresh coat of paint can solve a lot of ills, but when you’re painting a room, there is a lot that can go wrong. That’s why if you’re not careful about color choice and lean in the wrong direction, even a perfectly applied coat of paint can make a room feel strange. Three of the most common mistakes are easy to correct, we’ll go through them here. It can surprise you how much of an effect the sheen of your paint can have on your finished room. Depending on the amount of light, the same color in high-gloss may be too bright, while a matte might be too dark. Additionally, if you look for long-term wear, a matte will be less durable and more prone to showing dirt than a semi-gloss to a high-gloss finish. One of the biggest color issues that many homeowners face is a direct result of not considering their lighting as they made their color choice. Most hues run in a few directions, with blue, red, or yellow undertones. Depending on your light, these undertones can be more or less visible. With that in mind, if your color looks dingy, or a different hue than you expected, your lighting might be the culprit. There are no hard rules for how many or how few colors you should use while painting. Even so, there are a few things you should consider before going overboard with the color wheel. Remember that the only color in a room won’t be the paint you use. 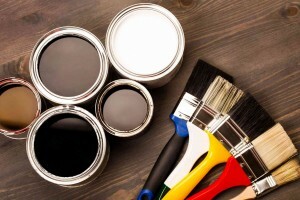 In general, your wall paint should help set the tone for the rest of your decor. If your style is minimalist, having accent walls may be critical, but it’s best to choose one or two primary colors and then add accents. If you fall on the other end of the spectrum and are using too few colors, you might be missing out too. While the idea of an all-white backdrop works for some aesthetics, in many homes it leads to a dull, dated result.